The purpose of this maintenance task is to help maintain the energy efficiency of the heat exchanger unit of your heat pump. A dirty unit is less efficient at doing its job, which means that your air conditioning unit has to work harder, which causes it to consume more energy, and shortens its service life. NOTE: The tasks and timings shown here for your Heat Pump (traditional) are based on a single-family home (owned), located in Massachusetts, United States, with priority set at ‘1 star' or higher, for all possible goals. If you set your personalization differently in your Home Wizard app, then you may get reminders for different tasks and timings in your recommended home care program for your Heat Pump (traditional). The "outside condenser unit" of your heat pump is the big box with the large fan in it located on the side of your house. This unit is where heat from the inside of your house is pushed to the outside (which is why the fan blowing air above the unit feels warm). Inside of the box are coils of pipe that are surrounded by thousands of thin metal "fins". These fins give the coils more surface area for exchanging heat. 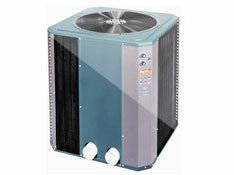 Cleaning the outside condenser unit of your heat pump involves four activities. Before doing any of these activities, be absolutely sure to shut off power to the unit and consult your owner's manual regarding discharging the capacitor and proper maintenance procedures for your unit. If you have any questions about how to do this, seek professional maintenance help. Remove leaves, debris, spider webs, etc. from the outside of the unit. Be careful to push debris away from the fins, not pushing debris into the fins. Remove leaves, debris, etc. from the inside of the unit (after ensuring that power is shut off to the unit). After you remove the cover grille, you can use a garden hose to spray the coils from the inside of the unit. If any of the fins are bent, you can use a special tool called a "fin comb" to straighten and clean them. The motor which drives the fan typically has ports which allow lubricating oil to be added (check your owner's manual). The benefits of this task can be somewhat high because this task helps ensure the energy efficient operation of your heat pump, and it helps maintain the useful life of a relatively expensive piece of equipment in your home. The cost of this task is moderately high. Cleaning the outside of the unit only takes a few minutes. But cleaning inside the unit and oiling the motor is much more difficult, and straightening the fins requires a special tool. This part of the task is probably best left to a trained professional, as part of your annual service work.